Whisk together the first 6 ingredients (buttermilk, water, eggs, salt, sugar and yeast). Add the 3 3/4 cups of flour one cup at a time until it is the texture of cake batter. There should not be lumps of flour. Place the batter in a warm place to rise. We use the oven. Warm your oven and then turn it off so it’s just about 90 degrees in there. Not too warm. Pour the batter in an oven proof bowl and cover it with a kitchen towel. Let it sit in a warm oven for 1 hour. It will about double in volume. You can put it outside in summer. In a large skillet, heat 3-4 Tbsp of oil over medium heat. 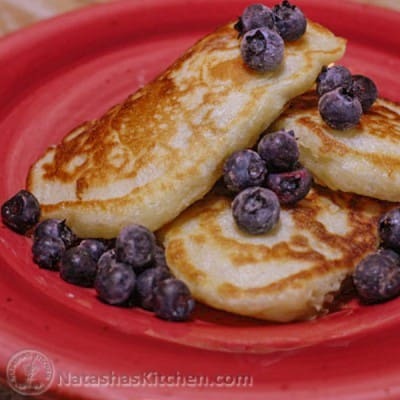 Place heaping tablespoons of dough onto the skillet and sauté until golden brown, then turn over. You can get better shaped pancakes if you use a wet tablespoon to put the dough in the skillet and scrape it off with a teaspoon. Continue to oil your skillet in between each batch. They turn out nicer on a well-oiled skillet.